There is a large body of information available on pecan horticulture, storage and handling and value adding – unfortunately little of this research has been conducted in Australia. Most research has been undertaken in the United States where pecans are a major industry. Similar climatic and environmental conditions can be found in Australia that are suitable for pecan growing, however Australia has one key advantage over America in that the Australian pecan industry is largely disease free. Particularly important is that Australia is free from pecan scab disease which is a major issue for pecan growers in North America and South Africa. This means that pecans can be grown without the use of pesticides in Australia. The following sections provide links to agricultural research and information which should assist existing and prospective pecan growers to find the answers they need. This is not a comprehensive guide to the literature available – growers are encouraged to browse the internet – but remember northern hemisphere dates need to be adjusted to suit Australia, match climate zones, and try to establish that the sources you use are reputable. Australian Pecan Growers Association Starter Kit. Free for members, $50 for non-members. Basic starter notes on pecan varieties, planting, budding, pruning, irrigation etc. Much of the information was prepared by Ross Loebel. with a focus on northern NSW, but is relevant more broadly. Monthly magazine from the Texas Pecan Growers Association. US$45 pa for overseas subscribers. Columns from all the top pecan experts; machinery and processing equipment US. Texas Pecan Handbook, Texas Agricultural Extension Service. All aspects of pecan growing and management. Texas, US climate is similar to parts of Australia west of the divide. Pecan Production in the Southeast – A Guide for Growers. All aspects of pecan growing and management in SE US. Climate similar to wetter sub-tropical/coastal areas of Australia. Lots of information on pecan growing in a climate similar to northern NSW. Growing pecan trees is a long term business – production commences after about 8 years with full production achieved by years 12 to 15 depending on the variety and environmental conditions. Growers are encouraged to thoroughly research their local climatic and soil conditions (such as soil depth, nutrients and salinity and number of heat and chill units), requirements for irrigation water licences, likely capital requirements and current pecan nut markets (bear in mind that by the time your trees are bearing nuts conditions may have changed). Areas in Australia with similar climates to those where pecans are grown in the US and Mexico are likely to be suitable for commercial pecan production. In 2002, the top four US pecan growing states (in terms of acres of pecan orchards) were Texas, Georgia, Oklahoma and New Mexico . Pecans are a naturally tall and spreading deciduous tree of temperate to sub-tropical regions. Pecans are tolerant of high temperatures in summer and require more than 2000 heat units to produce good quality nuts. Dry conditions in spring and early summer are critical for effective pollination and early nut development. Irrigation at this time of year is an absolute necessity. Most pecan varieties require 200-220 frost free days to mature nut crops, late spring frosts or early autumn frosts can affect yield. Pecans require less than 400 chill units (hours less than 7 °C); 200-300 should be adequate. Pecans are likely to be able to tolerate most winter conditions prevalent in suitable growing areas of Australia. See “Chill Requirement of Pecans” (Scott Clark – August, 2015). Pecans can grow in a range of soil pH (5-8); desirable levels are pH 5.5 – 6.5 as deficiencies can occur in more acid and alkaline soils. Deep well-draining alluvial soils are considered to provide the best growing condition for trees, with at least 2 metres of soil depth. Although the tap roots may reach 7 metres, most of the tree’s feeder roots occur within the top metre of the soil. It is therefore essential that adequate water and nutrition are provided in this soil zone. Pecans can be grown on heavier soils with higher clay content than alluvial soils but growth may be restricted and care with irrigation to avoid water logging is critical. Pecans will not tolerate salt in soils, groundwater or irrigation water. Planting pecans on slopes is generally not recommended due to lack of soil depth and the fact that the height of the tree (25 metres or more) makes tree management difficult and dangerous. Tree physiology, climate, soil and nutrient requirements. Alabama Pecan Growers, Alabama, USA. Pecan site selection and preparation. South African Pecan Growth and Development. Includes colour photos of shoots and nuts at various stages of development. (In the US) … pecan varieties can be classified into Eastern, Western or Northern types based largely upon climate and geographical location. Eastern varieties are adapted to the humid south-eastern states from Louisiana to Florida and have some scab tolerance or resistance. Since scab is not a problem in the arid West, western varieties do not have appreciable scab tolerance or resistance. Pecans are monoecious – meaning they have male and female flowers which open and mature separately. Varieties are classified as protandrous (Type 1) – the male flowers (catkins) produce pollen first – or protogynous (Type 2) – the female flowers are receptive first. Pecans require cross-fertilisation to reach full yields, so at least two varieties will be necessary in the orchard. Higher yields can be expected from having sufficient pollinator trees in the orchard. Variety selection and design of the orchard to ensure cross pollination is vital. Note: care should be taken in interpreting US variety information. Variety recommendations vary with climate zone and pest/disease loads e.g. Texas cf. Georgia. Searchable database of varieties USA. Pecan varieties recommended for Georgia, USA. Links to most of the USA pecan growers websites. Irrigation is essential for high yields and for good quality, well-filled nuts. It is not recommended that a pecan orchard be established without first securing an adequate, permanent irrigation water supply. Unirrigated orchards may produce from 0 to 10kg nut in shell per tree, whilst yields from adequately irrigated orchards should reach 20-30kg per tree. There are no other management practices which can compensate for insufficient water. Your local agricultural department will have information to assist in calculating irrigation needs in your locality. Drip irrigation for pecan orchards. It is recommended that soil and/or foliage tests are undertaken to determine the nutritional requirements in your orchard. There are a range of nutritional deficits and disorders of pecans reported in the US research – these may not be relevant to your soil conditions so it is critical to understand and analyse the soils in your orchard before applying fertilisers, soil conditioners, micronutrients or microbes. Care must be taken with the use of animal manures in orchards to ensure no contamination of nuts occurs. Use of poultry litter in Georgia. Australia has few of the pest and disease issues prevalent in America. Grass competition is one of the major problems facing young pecan trees. It is preferable to keep young trees weed-free for at least two years. Stahmann Farm Enterprises with Horticulture Australia Limited conducted research into a number of the key pecan pests at the Trawalla orchard near Moree, NSW. The table below summarises the results. Green Vegetable Bug Directly damages pecan nuts Release of parasitic insect – Trichopoda giacomellii. Timing of mowing orchard floor. Maroga moth Girdle or ring bark tree branches and trunks. Release of parasitic insect – Trichogramma spp. Longicorn borer (beetle) Agrianome spinicollis. Lay eggs in cracks caused by splits, pruning wounds, dead & dying timber. This can lead to limb and trunk snaps. Maintain healthy trees. Reduce shading through canopy management to prevent limb dieback. Leafhopper Leaf damage (reduce photosynthetic potential). Timing of mowing orchard floor. Insect pests and diseases – Texas A & M University. 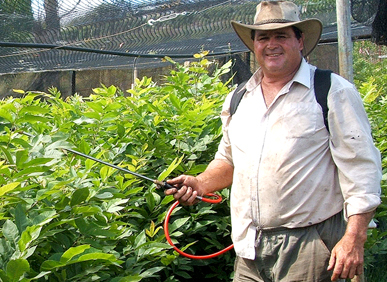 Integrated pest management in pecans – southern USA. Mississippi State University Extension Service. Training young pecan trees to a central leader system is essential to provide a strong structure for future production. The central leader system reduces splitting and breakage in later years, which impacts yields, and begins the process of managing light levels throughout the tree and orchard. Good advice is provided in the “Texas Pecan Handbook” Texas Agricultural Extension Service (Available from Texas A&M University) and “Pecan Production in the Southeast – A Guide for Growers” Alabama Cooperative Extension System (Available from Auburn University, Alabama). Guide to pruning young trees, USA. Pruning in later years is necessary to ensure sufficient light reaches inside the canopy of the tree and the orchard floor. Without canopy management yields will fall due to reduced photosynthesis and limb death occurs reducing yields and potentially allowing the incursion of pests and diseases. Plant tree rows North-South to improve light interception by foliage by up to 50% over an East-West orientation. Sunlight is required to produce food for the tree. This leads to a 25% increase in nut yield. Trees should be kept approximately as high as the distance between rows to avoid lower limb shading producing limb death and infestation points for borers and longicorn beetles. Taller trees than this do not necessarily produce more nuts because lower limb shading reduces production from the lower tree. Alternate the height that trees are topped off at to avoid producing ‘crows feet’ at that point. Prune more heavily coming into an on-year to reduce yield and over bearing and prune more lightly coming into an off-year. Prune to a flat topped triangular hedge to give more light on the canopy and hence more yield. This also helps reduce/avoid over shading of neighbouring rows. Once trees are at full height yield can be increased when water shoots are pruned off in summer (Nov-Dec). These shoots shade out but don’t give nuts for 2-3 years. 70-180mm lateral shoot length is best for nut production. Alternate row mowing every 6-8 weeks gives greatest reduction in green vegetable bugs and leafhoppers. This provides shelter for beneficial insects and for remaining pest insects – mowing the entire orchard drives them into your pecan trees! Guide to pruning mature trees, USA. Growing organically is possible, there are a number of APA members who have organic certified pecan orchards. Unfortunately published references are rather limited, but a few are listed below. Producing and marketing organic pecans in New Mexico. NMSU. Depending on variety pecan nuts may be ready to harvest from March until June. Mechanical harvesting entails: using a tree shaker to make the nuts fall; sweeping the nuts into windrows; using a harvester to pick up the nuts (including a good deal of debris); cleaning the debris from the nuts. This is followed by drying (to about 7% moisture content), grading and storage. Cool storage maintains quality and significantly enhances the shelf life of pecans – freezing lengthens shelf life further. Pecan nut quality declines as soon as the nuts leave the shuck, therefore harvesting, drying and cool storage is best undertaken as quickly as possible.